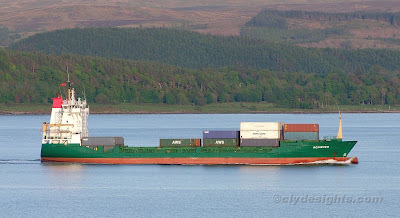 A first visit to Greenock on Friday was made by the container ship ACHIEVER, a vessel dating from 1992 when she was completed by the JJ Sietas shipyard at Neuenfelde as JUPITER. A sister of CERVANTES, a ship that was for many years a regular caller to the Clyde, she was renamed GRACECHURCH JUPITER in 1999 and subsequently became KATHERINE BORCHARD in 2002. She was renamed ACHIEVER in 2005. Now flying the Gibraltar flag, ACHIEVER has an overall length of 116.79 metres and a deadweight of 6,545 tonnes. She can carry up to 510 TEU containers. She is owned by a Norwegian company, which bought her and a sister vessel in 2006 for a reported $22 million, and is now employed on the MacAndrews service in place of CANOPUS J. What were the ships moored off a few miles north of Cumbrae on Monday 25th May? Two had superstrutures in the middle, and seemed to have the same colours (blue and orange) and one was a conventional cargo ship, I imagine.